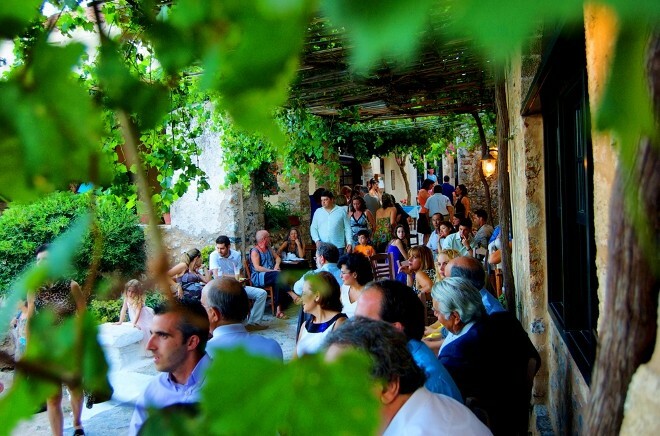 Byzantino traditional café and snack bar is located in a very privileged spot, just on the main square of the Old Town of Monemvasia, known widely as "Kanoni". It is a perfect place to relax enjoying your coffee or juice under the shadow of the arbor while the life of the town unfolds in front of your eyes. It is also very convenient for the parents with small children as they can watch the children while playing in the square. There are also offered salads and light meals, while in Byzantino you have the chance to live the experience of a wine tasting. The suggested full wine tasting menu includes 4 representative local grape varieties combined with the right "meze" (snacks), while, if you wish, you can create your own combinations under the guidance of our specialist. Of course, it's not necessary to taste all 4 wines and you can taste them individually. The price for a full wine tasting with the accompanying snacks starts from 24 EUR/person.